Name the file...something like .gitignore, for example. You'll get the "You must type a file name" error. Thanks, Mads, for the tip! 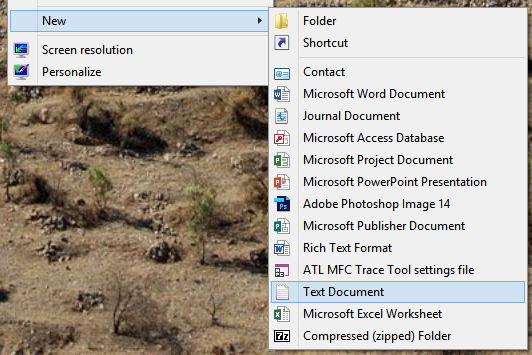 UPDATED: Mads has created an "Add Empty File" Extension for VS that makes it easy to create . files as well! Now that is a nice little tip! I always had to use the console for that little job! Thanks. That's easier than opening cmd and using move to rename a file. Nice! I always used to open a command prompt and run "echo foo > .foo"
Not sure if anyone is interested but I've been using a program Called Total Commander from ghisler.com for more years than I care to remember, even though I'm primarily a windows developer I barely touch windows explorer (still sour at microsoft for taking away the File Manager from windows 3.11 haha). To create a file there it's SHIFT+F4 enter .test and it will put you in your fav text editor. Recommend this to everyone that are keyboard and short-cut fans, if you love your mouse then it's probably not for you. Um not sure which version of windows you guys are using but on my version of 8.1 I have no issues naming a file beginning with a period. Folders however still give the same error and that fix works. Please note that you need to have "Hide extensions for known file types" unchecked in your system settings. Otherwise typing file name like Scott did would give a result of ".gitconfig..txt" instead of ".gitconfig"
Also this is a reason why it seems to work for @Peter DC, but under the hood it's not what you wanted. Nevertheless, great little tip. Yes - I want "file without name"
+1 for Total Commander! I am using it for 10+ years and still rocks! Nice little tip, thanks for sharing! I typically use Notepad++ for this. Type "notepad++ .gitignore" in the Explorer address bar while viewing the directory you want to create the file and Notepad++ will create the file and let you edit it. Great tip, though. Sometimes it's nice to just create the file and mess with it later. Open a notepad and save the document, but surround the name with quotation marks, i.e. ".gitignore". You will get the same. You just have to navigate to the directory, but nothing that couldn't be handled by copy & paste. Love your site Scott, keep up the good work! I do have one piece of feedback; the example pictures/text given isn't as clear as it could be. You change the target example text 1/2 way through the example (from .pooop to .gitignore). It would be more clear to the reader if .pooop was used throughout. This would remove a variable during the explanation and lead to a higher level of clarity. As it stands now, you have to read the text(teh horror) and examine the images to understand the solution. Really, the pictures could tell the whole tale if the example text was consistent. I see this A LOT when reading examples of code on the internet, even printed in some books. This is just nit-picky really, just wanted to throw it out there for you Scott! Well that's a bit hidden! I'm also using Total Commander for years. The only reason I use the Windows Explorer is to burn DVDs, like an iso file once a year. I had a copy of our default .gitignore file in One Note, but when you copy it it renames it to .gitignore.gitignore, because despite my actions Windows 'really' knows what I 'really' want I am trying to do?!? One has to question why Explorer considers this to be an error in the first place. It is almost as if the programmer who wrote the code for this error message did not understand what legal filenames are. After all, the attempted file DOES have a name, and a perfectly legal one at that. Really curious why this was implemented in this way. Kudos to the guys using Total Commander. It's just one of those programs .....you never leave home without. Provided you have git installed. Weak - why did you remove the "poop" reference? That was the best part of this post.